by PaulEMoz in "Bayonetta", "Devil May Cry", "Sega", "naughty witch"
I'm not ashamed to admit that I was gagging for Bayonetta for a long time before the game was released. Sure, it looked like a Devil May Cry game... no surprise, given that the director was responsible for both games. But the charm, wit and sauciness promised to elevate it to another level. And it did. Well, that, and the madness. There was oh, so much Japanese madness. 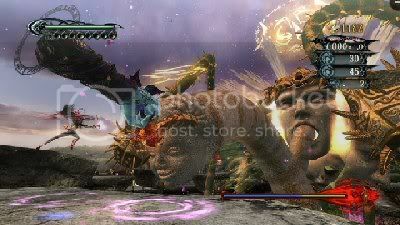 Few games cause you to burst out laughing at the sheer over-the-top ludicrousness of your own special attacks. Bayonetta dared to be different, to push its tongue firmly into its cheek and say, "yeah baby, you know I'm a good time". I see no ships. I don't really know what the hell those things are. There aren't many games that I've completed on the 360... there are even less that I've restarted on a harder difficulty level. In fact, there is but one. Can you guess what that might be? Yep... 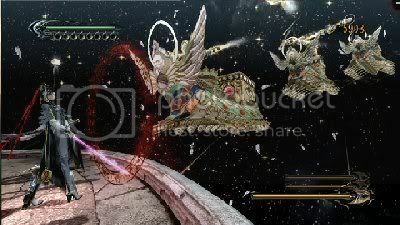 I'm now playing through Bayonetta on the Hard level. That's not something that's ever appealed to me with games before... when they're done, they're usually done. But I still had loads to unlock by the time I'd finished it, and I actually want all those weapons, moves and powers, just to see how I get on with them. Plus, it's just stupidly entertaining. And I didn't find the cutscenes so cheesy that I couldn't bear to see them again... just the opposite. They're full of sly, knowing winks and innuendo, and I'm all for that. Bayonetta is a brilliant videogame, one that was well worth my frothy-mouthed wait. It delivers everything that it sets out to, with style and flair. It's got a sense of humour, but it's not forced or to the detriment of the game. And it's packed with action, and for me, never gets boring. Money well spent, and easily in my top three blog games to date.